Built for inviting strikes from aggressive trout in early summer. WooDream describes it as being like a terrestrial that falls in the stream. With a bit of yarn or chenille or squirmy wormy tied to the hook eye, it could pass for a mouse imitation. Best suited for fishing in mountain streams. 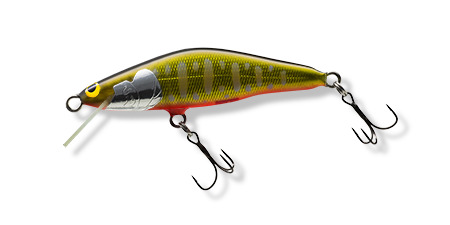 Pinpoint casting with high-pitch rolling action and natural drift. S-shaped path with steady retrieve, dying bait fish action with twitches. Out of stock. ETA late May. Steady retrieve attracts trout. Side to side flashes with twitches. Immediately vibrates upon retrieve. High pitch rolling action. Easy to cast with distance and accuracy. 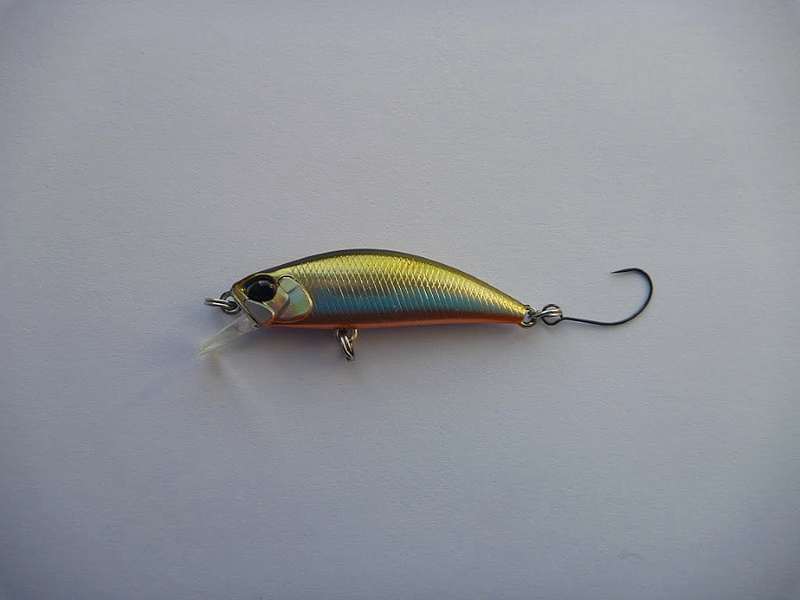 Yo-Zuri used to offer a single-hook version of the 2 inch Pins Minnow. It no longer does. These Pins Minnows come from Yo-Zuri with a pair of treble hooks. They will come from Finesse-Fishing.com with a single replacement hook taped to the box. Japanese lure fishermen prefer sinking minnows rather than floaters. The Duo Spearhead Ryuki is a sinking minnow whose flat sides and low center of gravity produce either a continuous twitch or a high performance swimming action depending on your retrieve. 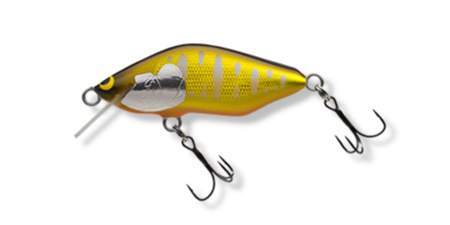 The heavy weight of the 50S adds to casting distance and accuracy with either a spinning rod or a baitcaster. The 38S may be more appropriate for smaller streams and spinning rods, but at 2.8g, it should be heavy enough for a UL baitcaster with a BFS reel. Each lure comes from the factory with two barbed trebles. Each lure will come from Finesse-Fishing with a single barbless hook taped to the box and a request to remove the front treble and replace the rear treble with the single hook. 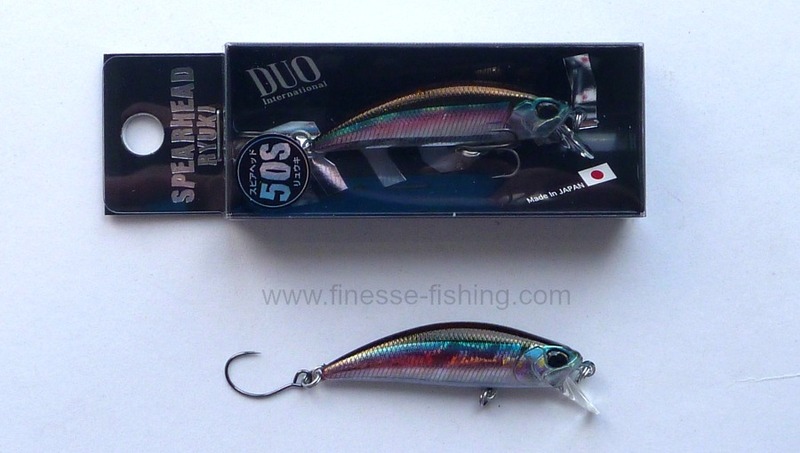 Duo Spearhead Ryuki 50S "Wakasagi"
Duo Spearhead Ryuki 38S "Tennessee Shad"
The first Japanese minnow lure I ever got was a Daiwa Silver Creek minnow. I thought it was a wonderful lure, and I caught a quite a few fish with it. Initially I was reluctant to import it, thinking it might be too expensive to sell well. However, the Spearhead Ryuki and Daiwa Step Darts have sold, so I have reconsidered. 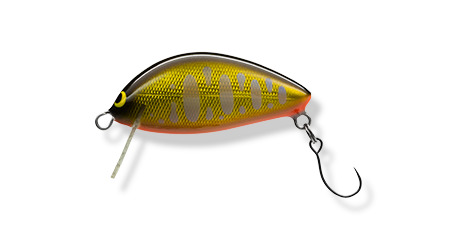 The flat sides and low center of gravity produce a very enticing wiggle with a steady retrieve and controlled twitches with a pulsed retrieve. The lures come from Daiwa with a pair of treble hooks. They will come from Finesse-Fishing with a single barbless hook taped to the box. Daiwa Silver Creek 50S "Salmon Fry"
Daiwa Silver Creek 50S "Black Gold"
Daiwa Silver Creek 44S "Red Gold Yamame"
Daiwa Silver Creek 44S "TS"
Domestic shipping is by USPS First Class Mail (unless ordered along with a rod). The $4 charge will be added to your order automatically. Shipping to international buyers requires additional postage. International First Class postage requires an additional $6 to Canada or Mexico or $10 to other countries. Add postage just once for multiple small items. If small items are being shipped with a rod, pay the additional postage on the rod page. When additional postage is paid for the rod, no additional postage is required for the line, lures or other small items. The buttons below are just for the additional shipping, not for the product(s) described above and the shipping. You must also click in the product buttons above. Finesse-Fishing.com does not sell to residents of the European Union or the European Economic Area. Payment is processed by PayPal but you do not need a PayPal account. You can use your credit card. Finesse-Fishing.com is a TenkaraBum LLC website. Payments will show on your statement as TenkaraBum.